Two of Bert and Margie Webber's books on Bayocean have slightly different photos on the front cover of the last house to fall into the sea. One was taken by Howard Sherwood on January 30, 1960; the other was taken by Burford Wilkerson on February 15, 1960 (the Bayocean sign where Dike Rd meets the mainland erroneously gives that as the date the house fell). On December 21, 1960, an article in the Tillamook Headlight Herald added earlier and later Wilkerson photos to show a progression. No one identified the owners of the house or the lot it sat on, which gave me an interesting subject to research. I first asked Bayocean alumni if they knew who owned three houses shown in a 1957 photo from the Maxwell Collection at the Salem Public Library. They identified the one in the middle as that of Lewis and Hilda Bennett, but no one knew who owned the cabin at the top of the hill. Given the nature of gravity, that one seemed like the best candidate. 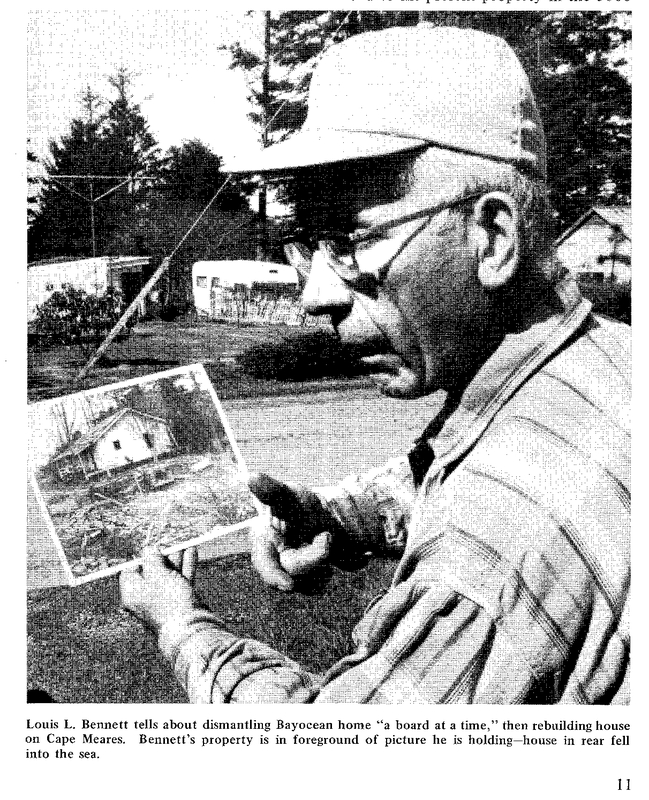 After following many leads down rabbit holes, I was looking at Webbers' What Happened At Bayocean and noticed a photograph on page 11 of Lewis Bennett holding another photograph of a house in shambles that the caption said fell into the sea. Bennett's property was in the foreground sans house, because he'd already disassembled it and used the lumber to add onto a place he bought on Cape Meares. Looking at a Bayocean Park plat map I saw that the property just above Bennett's was lot 26 of block 57. At the Tillamook County Pioneer Museum I found the original of the photo that Bennett was holding. A note on the back said "Last House In Bayocean." It was taken by Hershel Stuart on February 4, 1958. Mabel Johnson gave it to the museum September 6, 2006. Thank you, Mabel, and others who make such gifts: you often make my day! Now the trick was figuring out who owned lot 26 in block 57. 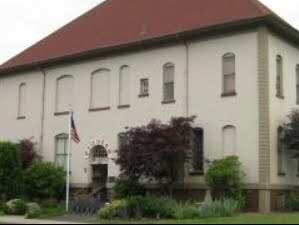 Since deed books in the Tillamook County Clerk's office are indexed by the last name, and not by the lot numbers, I had no way to get there directly. But while looking in the direct index for something else I came across a list of people who gave perpetual easements to the Army Corps of Engineers in 1956 as a condition for construction of the breakwater that closed the gap. Notes next to each name showed the lot and block numbers. Lots 24-26 of block 57 were owned by Otto and Maldeenna Notdurft. Searching online directories I was sorry to read that both Notdurfts were deceased. Norman Notdurft was suggested as a possible relative by People Smart, so I called and left a message. Ten days later he responded, saying he was the only son of Otto and Maldeenna. Norm confirmed the house on the cover of Webbers' books was theirs. Tillamook County deed books show that Otto and Maldeenna bought the cabin and two other lots during 1943 and 1944. Norm said they only visited their cabin a couple times a year, so didn't get to know the permanent Bayocean residents. This explains why Bayocean alumni didn't remember them. Norm did play with Sally Bagley, who was about his age, and got to know her again when they attended Oregon State University. Norm and Sally's husband ended up on the same military base so the couples socialized. When the Notdurfts viewed the damage wreaked by the 1952 storm they assumed their cabin had succumbed and never went back. 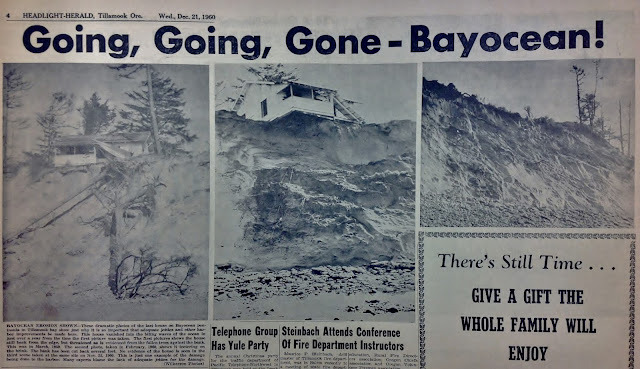 The 1999 edition of Bayocean: The Oregon Town That Fell Into The Sea, that they possessed, doesn't have a caption saying that their cabin was the last to fall, so they didn't realize they had that distinction. Despite that, they kept paying taxes until Tillamook County stopped charging them, and it's still in their name. When a winter storm ripped a 3/4 mile wide gap between Cape Meares and Bayocean Spit on November 13, 1952, the sand covered oyster beds in Tillamook Bay. 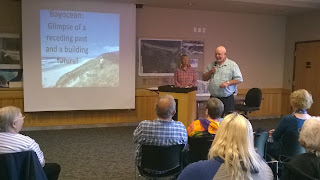 Over the decades that followed, research confirmed the residents' belief that construction of the north jetty at the entrance of Tillamook Bay, without a south jetty to match, caused the destruction of the spit and its resort town. What no one realized then was that this larger breaches had happened long before jetties were ever considered. 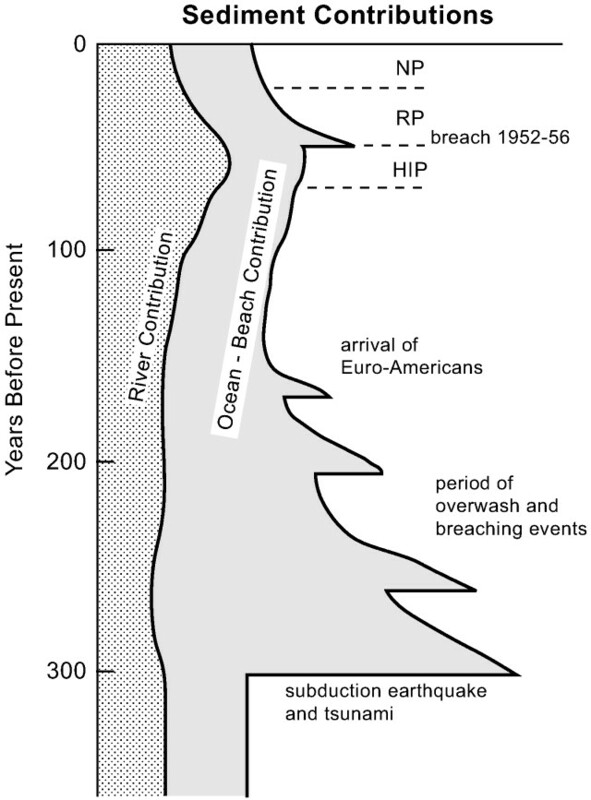 In "Sediment Accumulation in Tillamook Bay, Oregon: Natural Processes versus Human Impacts" (Journal of Geology; July 2004), Oregon State University oceanographers Paul D. Komar, James McManus, and Michael Styllas conclude that the Bayocean Spit was breached many times - and to a much greater extent than in 1952 - following the last major Cascadia subduction zone earthquake in January 26, 1700. Figure 10 on the right makes the point graphically. 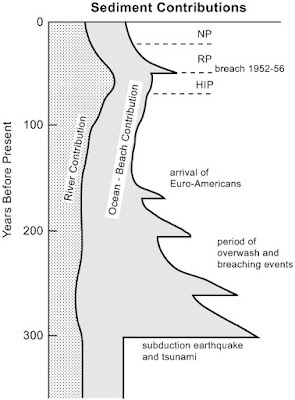 Studying Tillamook Bay core samples, the researchers found several layers of ocean sand (differentiated from layers of river sediment) in the century and a half after the 1700 earthquake, most of which were larger than the layer attributed to the years 1952 to 1956 (when the gap was closed). They knew from the research of others that fault movement accompanying the 1700 earthquake had lowered the elevation of Bayocean by a meter. This then made it possible for severe winter storms to breach the lower-elevation southern end of the Bayocean Spit. The breaches ceased, and the spit reconstituted by natural processes, prior to the arrival of white settlers. I used to love sitting around the campfire and hearing the tale of 'Thunderfish' being told by a Native American local. 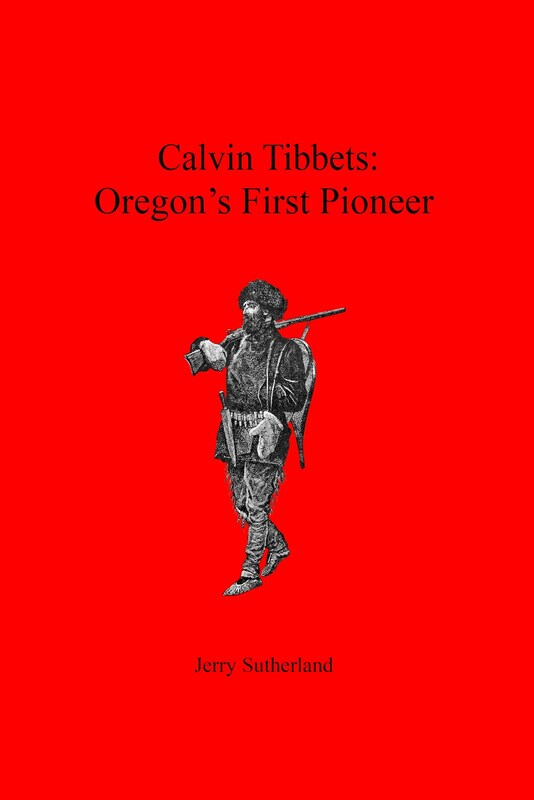 Seems that tribes from the South came up to drive away the People's of the Tillamook... when they called upon Thunderbird to save them. Thunderbird flew far to sea and spoke to Thunderfish, who raised his mighty tail high above the water as Thunderbird flew back to tell the People's of the Tillamook to flee to the highest mountains. Then the mighty Thunderfish slapped his tail upon the waters, shaking the very land itself and sending a wall of water over the lands, drowning the invaders from the South and cleansing the land of their existence. Then the People's of the Tillamook returned, making sacrificial offerings of the survivors from the South to both Thunderfish and Thunderbird for their great help... the People's of Tillamook lived for many moons in peace until the great fish with white wings brought the White men to their lands....and the rest we all know, is history! Legends from other tribes are told at Native American Legends of Tsunamis in the Pacific Northwest. In "The Really Big One" (The New Yorker; July 20, 2015) Kathryn Schulz includes similar legends, and then notes: "It does not speak well of European-Americans that such stories counted as evidence for a proposition only after that proposition had been proved." It is indeed hard to imagine T.B. Potter asking Tillamooks what they thought of his plans for Bayocean Park. Sunday Night Football ran past KGW's scheduled time to run Grant's Getaways: Bayocean on TV last night. It's been rescheduled for 11:30 PM, next Sunday, October 25th. It will also air Saturday, December 12, at 9:00 PM. 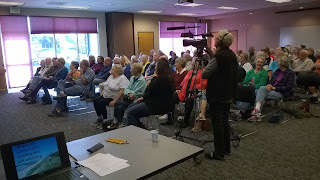 Northwest Cable News (NWCN) will air the show at 10:30 AM and 5:00 PM, next Saturday, October 24th; and 5:00 PM, next Sunday October 25th. I don't know if scheduling is different for those outside Portland, so be sure to check you own listings if you live in Seattle, Boise, or Spokane. You can read about the day Grant and his videographer/producer Jeff Kastner filmed Bayocean last summer at Grant McOmie Captures The Bayocean Story. They did another show off the shores of Bayocean you can read about at Grant McOmie Cockle Clamming at Bayocean. If you cannot watch these programs on TV, my posts provide online viewing options.